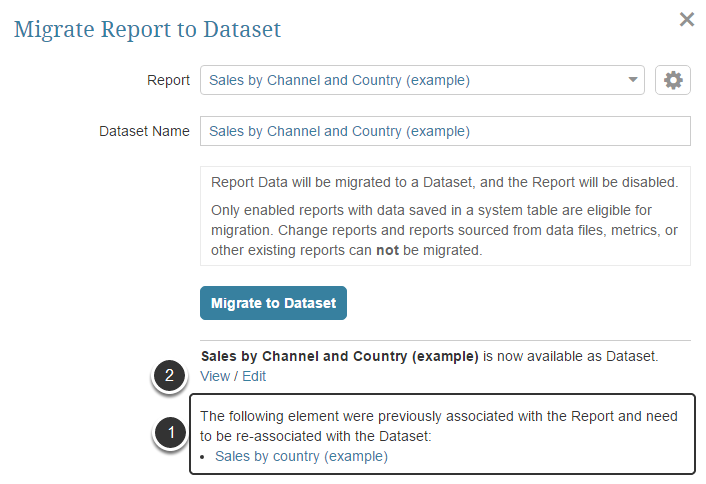 The Migrate from Report to a Dataset function will not be supported in Version 6 - please migrate any Reports prior to installation of V6. Reports and Datasets have similar nature: each of them displays data in the form of a Table. 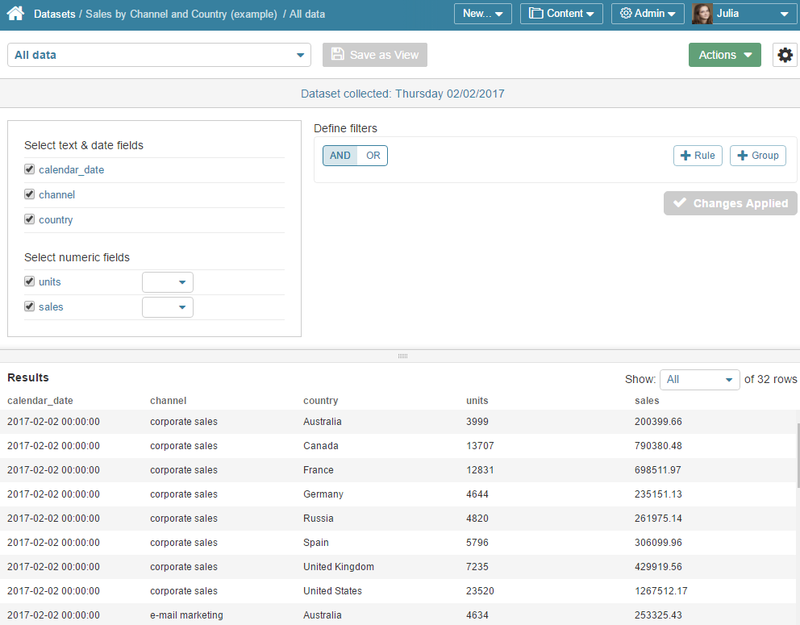 Datasets provide extended functionality by providing the ability to choose certain fields, create complex filters and save your selection as custom Views which can be further used for creating new Reports and Metrics in few clicks. Datasets are aimed at automating system behavior and releasing Administrators from ineffective routine tasks. Taking this into account, we offer the ability to effortlessly migrate data from regular Reports into Datasets. Follow the steps in this article to learn how to do it. Choose the Report that you want to turn into a Dataset, open its editor. NOTE: This option is only available for Reports sourced from configurable Data Sources, such as a SQL database or from a plugin. At the bottom of the page set the Use Report as Source field to 'yes'. The system saves data in a Table and generates the Table name below as shown at the picture above. Now this Report can be converted to a Dataset. Select the Report which should serve as a source for a future Dataset from the drop-down list. (This drop-down list is populated with the Reports that are (1) sourced from a configurable Data Source (SQL / Plugin) and (2) may be used as Source (are saved as system table as shown at the previous screen). If you invoke the Migration Utility from the Report Editor or Report Viewer, this report will be default in this drop-down list. 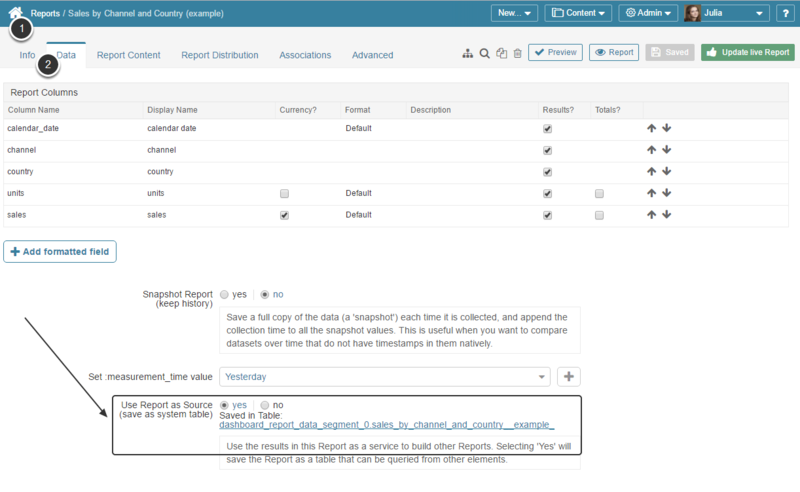 Define the name of a future Dataset, The system automatically offers the same name as the source Report has, however, you can change it to a unique descriptive name of your choice. If the Report that you used to create a Dataset also serves as a Data Source for some Metric or another Report, the system will display a reminder to re-associate those elements with the new Dataset. Click View to open the Dataset Viewer and Edit to open the Dataset Editor. Settings: Dataset settings which are identical to those that Reports have (Measure, Category, Snapshot dataset?) are automatically duplicated from Report settings. Permissions: NO Permissions (can be viewer at the Report Editor > Advanced tab > Permissions) are automatically delegated from Reports to Datasets. Dimensioned Reports: If the Report which serves as source for a new Dataset is Dimensioned, a column with Dimension Values is going to be added to a Dataset.